The 2016 Kia Rio is a sub-compact car with a dynamic Gasoline Direct Injection (GDI) Engine that makes driving fun again. With all the same features as high-priced vehicles and inimitable small-car style, the 2016 Rio is a fantastic investment. It offers some hot new high-tech amenities, a dramatic new take on the brand's tiger-nose grille, and the same value and quality that Kia is famous for. We think the Kia Rio is the most perfect city car ever produced. We are Cumberland Kia, one of the oldest and most trusted Kia dealerships in the area. Many of our first-time buyers are surprised to learn they can afford to drive off in a playful new Rio, when they thought their only option was a used car. Our customers come from Lebanon, Crossville, Mcminville, Franklin, and Chattanooga, and we aim to please. Visit our modern showroom at 1560 Interstate Dr in Cookeville, TN, for a first-hand look at the peppy Kia Rio. The awesome Kia Rio is the third generation of the model, which has been pleasing drivers since 2000. In the last two years, it has undergone major facelifts and refreshing upgrades, not to keep up with the times, but to stay ahead of them. Look at the new fascia, repositioned headlights, and foglight hoods, just for starters. It gives the Kia Rio a distinctive flair that sets it apart in a world of 'me too' cookie-cutter sub-compacts. The new version of Kia's identifying grille will make you look twice, and wonder out loud, That's not a Kia - is it? Yes it is! When your family and friends see you coming down the street in your gorgeous new Rio, no one will mistake it for a rental car. The headlights have been moved inward to make the 2016 Kia Rio look more aggressive (and more expensive), and the satin-finish bezels add just the right amount of understated bling. On the flip-flop, you can show off the new broad-shouldered taillights and updated rear fascia. Wherever you take your faithful Kia Rio, it makes YOU look good. There is enough get-up-and-go in the Rio to keep you on the fast track, thanks to its naturally-aspirated 1.6L four-cylinder engine that provides 138 hp and 123 pound-feet of torque. You can choose the six-speed automatic or the six-speed manual transmission, and they both make the most of the Rio's unique Gasoline Direct Injection (GDI) system. This puts the New Kia Rio very close to the top of the list of budget-friendly subcompacts that give you high performance and power. And fuel efficiency is also enviable in the new Rio, with an EPA-rated 27 mpg city/37 highway/31 combined. 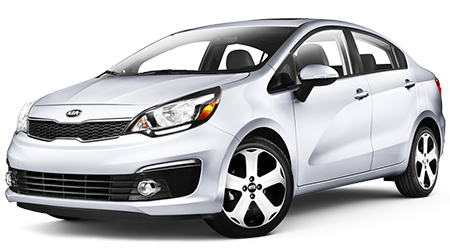 Everyone loves the Kia Rio, and you can see why at Cumberland Kia, 1560 Interstate Dr in Cookeville, TN. We just received a nice selection of the 2016 Rio in all the hottest trim levels and colors. We do have the hard-to-find Urban Blue and Digital Yellow colors currently in stock, so hurry down before these eye-popping Rios go on back-order. Our service area includes Lebanon, Crossville, Mcminville, Franklin, and Chattanooga, so make us your destination dealership for sweet deals on the spunky 2016 Kia Rio. Don't be late!